(App Only) Download ShopBack App & enjoy Shopee with up to 80% off daily! Giftr is your one-stop solution for gifting needs, providing you a gifting experience through carefully curated gift selections. Make that dinner slightly more special, whether you're eating in or dining out. Those who love celebrating Valentine's Day have St. Valentine to thank. St. Valentine was a Roman priest during the time when Emperor Claudias II was in power. The Emperor set up an edict that prohibited marriage, for he believed that unmarried men would fight harder than married men during wartime. Legend has it that Valentines, who strongly believed in love, continued to secretly wed couples in the Christian Church, but was later apprehended by the Romans and sentenced to death. Other versions of this story state that Valentines then fell in love with his jailer's daughter and later wrote a note to her, signing off with “From your Valentine”. Valentine's Day was then founded to celebrate the spirit of St. Valentine, and 14th February was chosen, for it was believed that it was the day that lovebirds mated every year. 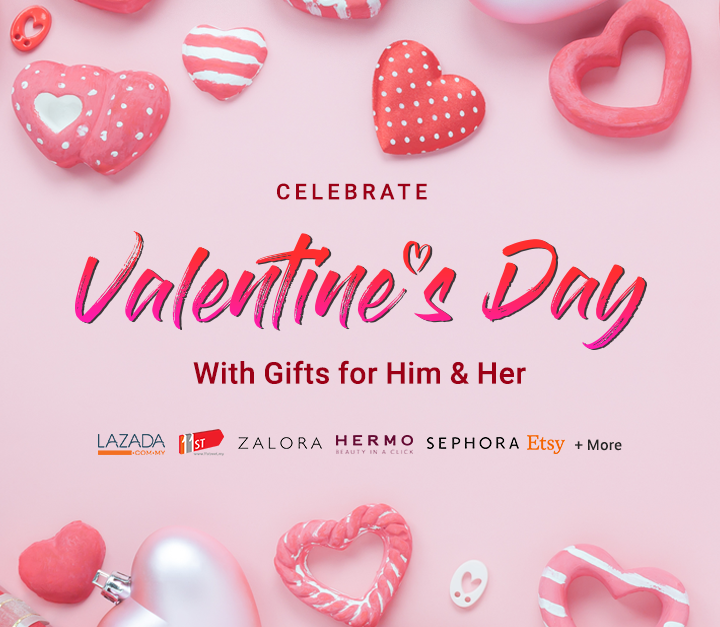 Get fantastic Valentine's Day discounts by using the Zalora's festive promo code. Zalora has tasteful clothes, shoes, bags and accessories that are sure to make you seem all the more desirable to your date! Get all the Valentines' Day promotions for staycations and holiday packages! If you're planning a romantic getaway for you and your other half, then be sure to check out AsiaRoom.com, Expedia and Hotels.com for awesome accommodation deals! You could be booking a great hotel with discounts of up to 73% off. You don't have to spend excessively to plan the perfect weekend trip with the love of your life, thanks to these awesome Valentine's Day travel promos. One of the best ways to show your appreciation and love for someone is by sending them a thoughtful gift along with a heartfelt note. If you're running out of creative Valentine's gift ideas, no worries! ShopBack knows where you can find the best deals and discounts for the perfect romantic gift. One of the most timeless gifts to give your loved one is a watch. At Daniel Wellington and eWatches.com, you could get promos of up to 15% off storewide and up to 95% off respectively for watches of your choice. For other gift ideas, do visit StrawberryNet.com, where gift sets are on discounts of up to 70% off! If you're still stressing over what to get, consider visiting the Fashion and Lifestyle sections of our ShopBack website where there are other great deals in store for you. ShopBack gives you cashback for all your purchases made, so what are you waiting for? Start shopping for your loved ones now! Have a great Valentine's Day and we wish you all the love in the world!